In some bizarre way, the terrible call Angel Hernandez made in Cleveland is a great argument for more video replay and also no replay whatsoever. Oakland trailed by one run in the ninth inning when Adam Rosales hit what appeared to be a home run. Angel Hernandez, however, had it as a double. 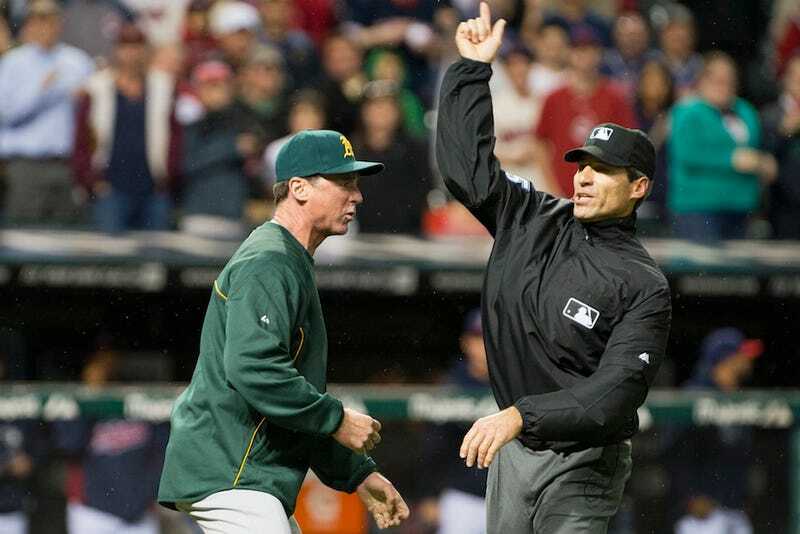 Bob Melvin disagreed and a the umpires went to check the video tape. A few minutes later the umpires re-emerged and upheld the clearly-incorrect call. Angel Hernandez then tossed Melvin. Oakland lost to Cleveland 4-3. On the one hand, umpires need a lot of help. Clearly. Four of them can't even tell that this obviously hit, and redirected from, a point beyond the yellow line used for just these sorts of situations. On the other hand, if they can't even get things right with the assistance of instant-replay video, what are we wasting our time for with pointless replays? All we're doing is just really, really bumming out this broadcasting crew. After the game, Susan Slusser spoke with Hernandez and when he wasn't being generally evasive, he was giving answers that did not really inspire confidence in the review process. Now, that's a whole lot of qualifying for a lot of the non-human parts of the equation. Maybe the umpires didn't have a great TV to view the replays on. Or, maybe they didn't have great replays to view on a great TV. Or maybe they had neither great replays nor a great TV to view them on. Or maybe Ron Washington is on to something.